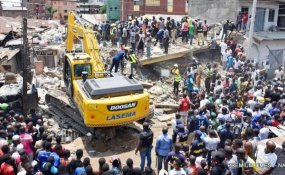 A rescue team search for more victims from the scene of a building, which collapsed at Itafaji on the Lagos Island on Wednesday. The minister of health, Prof Isaac Adewole has arrived Lagos this morning to visits survivors at various hospitals and sympathized with relatives of victims of the collapsed building. It would be recalled that survivors of the collapsed building incident which occurred on the 13th of March 2019 at Ita-Faji in Lagos Island local government area of Lagos State were taken to Mercy hospital, Island Maternity Hospital, Igbobi general hospital, Lagos State Teaching Hospital (LASUTH), Lagos University Teaching Hospital (LUTH) and Gbagada General Hospital. The commissioner for health, Lagos state, Dr. Jide Idris said survivors are stable and responding to medical treatment. Idris early this morning while on a visiting the survivors at the General Hospital in Lagos Island said, "I am delighted to note that the survivors of the unfortunate incident are calm, stable and responding to medical treatment and in no time, some of them who are certified and cleared will be discharged to join their families." He seized the opportunity to reinstate the instructions of the Governor of Lagos State, Mr Akinwunmi Ambode that medical care will be at no charge to the affected families. Idris said, "As directed by the Governor, medical care for the surviving victims of this unfortunate incident is free. Lagos state is offering comprehensive health care to the victims at no cost. This is the least we can do at this time to ameliorate the suffering and trauma being experienced by the affected families." On the allegation that some of the patients are being requested to pay for medical treatments, Idris refuted this noting that investigations have revealed that these are false claims, probably cooked up by unscrupulous individuals for the sake of sensationalism. "The allegation that affected people are paying for the comprehensive health care offered to survivors is false and baseless," he responded. He however warned concerned and affected families to beware of people of doubtful characters posing as health workers who may want to take advantage of their vulnerability and anxiety at this period. He further reiterated the utmost commitment of the State Government in ensuring a zero fatality of those who were rescued alive. He assured that the state government will leave no stone unturned in giving quality health care to Lagosians regardless of age, religious, gender or ethnic affiliations. 'We are committed to the provision of affordable, quality and unfettered access to health care delivery in the State. He also put on record his condolences to the families bereaved by this sad incident saying "I want to commiserate with the families of those who lost their lives in this collapse building. I want to quickly let Lagosians know that this is quite an unfortunate incident."